March 15th, 2013 (Wilmington, DE, USA) – Yesterday Shri Tapan Ghosh was arrested from his residence in Kolkata, West Bengal, India under P.S. Case No. 52/dt 05.02.2012 u/s 295 A, 298 and 120 B (IPC), for reasons that are ambiguous. More than thirty-seven other activists including Mr Bikarna Naskar have also been arrested, in a matter of few days. Shri Tapan Ghosh is a leader for Hindu human rights both on National and International scale. Recently CNN—an American news channel published an article andinterviewed him at New York City (USA) on the great social service Shri Tapan Ghosh has been doing in West Bengal for like helping Hindus rehabilitate in riots hit area, saving kidnapped Hindu girls from Islamic radicals and donating grocery and items of basic necessity to displaced Hindus across West Bengal at http://ireport.cnn.com/docs/DOC-490900. Hindu Samhati’s efforts have been lauded by renowned human rights activists like Dr. Richard Benkin (USA), Dr. Gautam Sen (London), Swami Sanghatmananda (Bharat Sevashram Sangh), and Swami Tejasananda (Bardhaman) at a massive rally organized in Kolkata on 14th Feb 2013 to protest against continuous violation of cease fire from Pakistan and beheading of Indian Army soldiers. In USA, Europe, Australia and many other countries around the world people gather in thousands to hear him and his struggle to support-sustain and defend Hindu human rights worldwide. 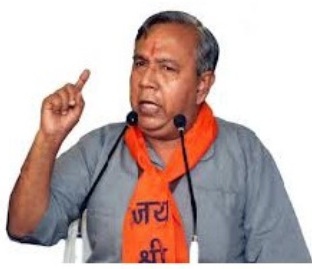 In 2012 at Hindu Memorial Day held at Houston, Texas, Shri Tapan Ghosh spoke about continuous human rights violations West Bengal Hindus are facing. His articles and blogs are given high accord at various national and international forums. His knowledge, wisdom and leadership qualities to serve Hindu human rights have been applauded by numerous international institutions. 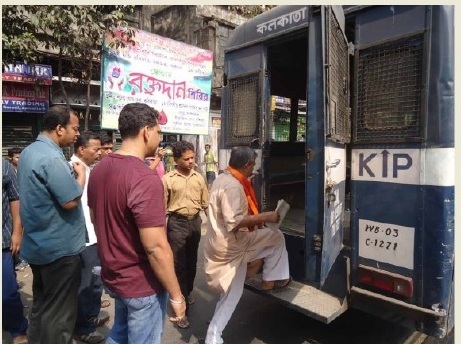 By arresting such a patriotic son of the soil, the administration has jeopardized the confidence of social service activist and has fanned human rights violations against Hindus in West Bengal by Islamic radicals. It appears to be evident that Shri Tapan Ghosh was arrested for an event (Jalabaeria) that he was 80 kms away from and that he has been arrested under statutes used to prosecute terrorists. This would be laughable if it were not such a serious mis-application of the law. Whatever Tapan Ghosh has done has always been lawful, peaceful and without use of arms, things that the Jihadi elements in West Bengal and the rest of India do not recognize. Hindu Mahasabha of America (HMSA) strongly demands that WB Administration led by Smt. Mamata Banerjee to act swiftly and facilitate the release of Shri Tapan Ghosh and not allow this arrest to be a by product of political vendetta towards appeasement of radical Muslim groups before the Panchayat elections in West Bengal. HMSA seeks safety of Shri Tapan Ghosh and all the arrested youth during his arrest and assurance of good health during his captivity. HMSA plans to further protest against this arrest in America media and organizations and present resolutions reports of HMSA to US & Indian Human Rights Councils until safe release of Shri Ghosh. It’s to be noted here that Hindus voted for Trinamool Congress at recent state elections for a change in West Bengal not for suppressing their organizations and community leaders like Shri Tapan Ghosh.